We offer bespoke adventure days out in the mountains of Snowdonia and on the coast of Anglesey. We can help you make your stag or hen party a memorable one with a range of activities that can be mixed and matched for a great day out. Full and half day activities, or a combination of two activities in one day. All designed to suit the needs and aspirations of your group. We can cater for all ages and levels of expereince, why not get in contact to discuss your requirements. Action packed days with varying levels of adventure to suit the requirements of your group. Flexible start and finish times to fit in with timings for the rest of the day. We provide instruction at a maximum ratio of 1 instructor :10 participants and specialist safety equipment required to enjoy the activity. The price we quote will cover instruction and safety kit. You need to provide your own transport, food & drink plus change of clothes, towel and a pair of old trainers to wear on your feet for the wet activities. Snowdonia Outdoor Adventure is run by Paul James. 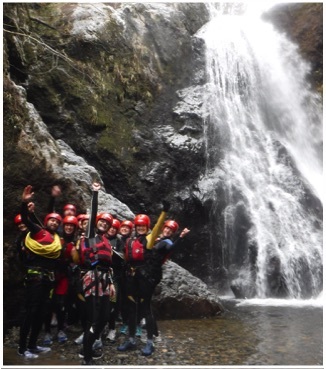 We provide unique water and rock based adventure activities - Coasteering, Gorge Walking, Rock Climbing, Mountain Walking, Abseiling and Sea Level Traversing.